Recently, we had a couple of people ask how to download and print our easy landlord forms. It’s actually extremely easy to download our landlord forms, however I wanted to write up a quick step by step guide with images just to show how you download your forms or agreements. After you have created your easy landlord forms from one of our many form selections, including our rental agreement form, commercial lease agreement and eviction notice, you will be taken to your “My Account” page. Once your form has been created, you will be logged in automatically to the “My Account” page. If for some reason you aren’t taken there immediately, you can simply click here to login and you will be logged in to your account and taken there. From there, I have a choice. I can choose to download the landlord form in HTML file, or in RTF format. If I choose HTML format, I will get the option of saving the form to my computer, or opening the form. If I choose to open the landlord form in HTML format, it will open in my default web browser – ie: Firefox, Chrome, Internet Explorer. From there, I just go to the File Menu and choose Print to print my landlord form. 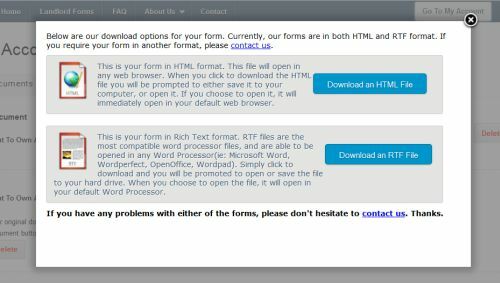 If I choose RTF format, I also will get the option to save the form to my computer or open it. If I choose to open the file, it will open in the default Word Processor that I use. Word Processing software can include Microsoft Word, Wordpad, Microsoft Works, OpenOffice etc. RTF formats are the most common word processing type of document, as they can be opened by the majority of Word Processors. From there it’s simply a case of going to File/Print to download my landlord form/rent to own agreement. So that’s how you download and print our easy landlord forms. Of course we understand that sometimes people still have problems – sometimes their computer security may be too stringent, or they may encounter some issues when downloading. At any time – please contact us if you have any issues. We’re always happy to help and will make sure you get your landlord forms, even if we need to e-mail them to you.